Abject failure: Let’s save tine on the press conference, publiscity stint of last night, and the verdit on the first 100 days, which I’ve already rendered anyway. I suppose, though we could give yu some indications of Obama’s huge success story. Let the UAW, as new owner of GM, pay the price for the overgrown work rules of its locals. Let the UAW demand above-market raises from itself. Let the UAW try to raise money from new lenders after the previous round of lenders has been royally screwed (thanks, in part, to the UAW). And then let the UAW try to sell the cars that result. I’ll add, let the UAW work under the rules of the game that the new owners… The US government, has placed on them in terms of the kinds of cars that can be built, and we’ll see how well they sell. To date, the cars the left wants built, don’t’ sell. The Volt seems a great place to start. Let them stew in their own juices. What Kaus misses however, is what happens when the repercussions of that arrangement come home to roost? Certainly we’ll all know what killed the American Auto Industry. trouble is, we’ll have cured the decease, but killed the patient. They’ll be no doubt what killed them off, and very little argument in political circles afterwards, but still, no life in the subejct. So, what’s the point? The other thing, of course is that there will be no stopping the government from printing more greenbacks to keep the unions afloat. Somehow,either way this falls out, I don’t see that as an overall plus, but I suppose there’s very little for it, if we can’t delay this nonsense until the midterm elections. Oh, Hopey Changitude. NORK Rides again: Seems North Korea…. well, at least the little gargoyle… has decided to respond to the UN security council. essentialy, the answer given is “Get stuffed”. Another great bit of work under the flag of Obama foreign policy, huh? Oh, Hopey Changitude. The Economy, too: The GDP fell more than expected last quarter. A great Obama Victory . Oh, Hopey Changitude. Apparently, the Tea Parties now officially exist… though Barry clearly still doesn’t understand them. Still, let’s have that serous conversation, Barry. Do you suppose he’ll ever have the stones to address this? You know better, don’t you? Oh, Hopey Changitude. It’s all yours, Barry: PrezBO is trying to disown the deficit he created. It’s all done with mirrors and hope. Oh, and Barry? When even the AP calls you a liar , you have serious problems. Feedback: Lots of great feedback from my post on American Thinker, yesterday . I’ll tell the truth here. I’m enough of a fan, that I consider it an honor being mentioned in the place. The place oughta be on your regular read list. Tom seems a nice guy, too. I’ll be submitting more over there as time goes on, and we’ll see where it goes. 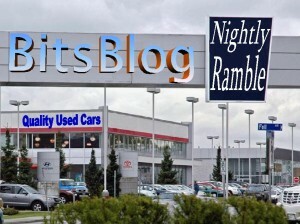 More feedback: The Pajamas Media post last week  is still catchng traffic, apparently, if I read the inbounds to this blog, from the place correctly. It’s getting easier, writing for blogs other than this one, though I’ll admit there was an adjustment period. In establishing a style, here on BitsBlog, I was told I tended to be too formal… and frankly, that was a problem breaking out of that box. Now, I find myself forcing myself back into that box, or at least finding a balance that keeps things readable. Apparently, I’m not doing badly, though, so it’s all good… as learning experiences are. Running for cover: I note this Horror story in the Netherlands. I note also, though, their apparent reluctance to identify the nationality/ethnic background of the driver in question. What do you want to bet this is yet another example of Jihad? I wonder more, if we’ll ever be told about it.